Steve: Welcome to our podcast listeners, wherever you may be in the world today. This is Steve Shallenberger, your host with Becoming Your Best Global Leadership. We have an outstanding guest with us today. It’s Kevin Eikenberry. He’s a terrific fellow, I’m going to tell you about him in just a moment. He’s been named one of Inc’s top 100 leadership and management experts in the world and is the author of several books including Remarkable Leadership. So welcome, Kevin. Kevin: Hey Steve. It’s a pleasure to be with you. You know, I had you on my show, it was great and so I’m happy to be on yours as well. Steve: Yeah, that was a lot of fun, wasn’t it? Kevin: It was. It really was. Steve: You’re a terrific interviewer and I enjoyed just the chance to talk about leadership and Becoming Your Best and Remarkable Leadership. These are great subjects of helping people unleash their greatest potential and that’s something that we share as a passion, so this will be fun to visit together with you. Kevin: It’s my favorite thing to talk about. Steve: Well, here’s just a little background so that you know something more about Kevin. He is the contributing author to The Handbook of Experiential Learning. Listen to these subjects that go back just a ways here, Masters of Sales, 101 Great Ways to Improve Your Life and the best-selling, Walking with the Wise. These are fun subjects. His writings in both past and what he continues to do has been published in newspapers, magazines, trade journals, websites from all around the world. He’s a frequent guest on radio shows, so he has a lot of experience. In addition to the fact that we do know each other, I love his picture. Kevin’s picture is just a happy, fun loving looking guy. The type of guy you’d like to sit down and go to work on being your best on. Kevin: You know, I’ve had people say a lot of things about me, Steve. I’m not sure I’ve heard that very often, but thank you. I will say this, I’ve had people say, Kevin, you look just like your picture and I always want to say, what else am I supposed to look like? Steve: That’s great. He’s worked with Fortune 500 companies, small firms, universities, government agencies, hospitals and more. Well, let’s get going, shall we Kevin? Kevin: I’m ready, man. I’m buckled in. Steve: All right. So maybe the first question I have for you is, I think our listeners would love to hear about your background especially including any turning points in your life that have had a significant impact on you. So what’s your story? Kevin: So I was born…No, we’ll fast forward on that. I think in terms of things that makes sense to where we’re headed today with our conversation, Steve. I grew up on a farm in Michigan, and that really informs a lot about who I am. I mean, I think a lot of people when they meet me, they don’t think I look like the stereotypical farmer, whatever that is. I certainly don’t live on a farm, although I own the farm that I grew up on and spend as much time there as I can. I think that my kid hood on a farm and in an agricultural related business where I had the chance from a very young age to have to do work that really mattered for our family’s livelihood and having young parents where in many ways, you know, my dad took me everywhere. I was in all sorts of meeting from a young age. And so, there’s a lot of things about my early life that I think say a lot about where I’m at today, Steve. I often will use metaphors about planting and nourishing and all those sorts of things and those things all come from…You know, I talk about nourishing relationships, not building relationships, and that’s just a simple sort of connection to that farming or agricultural background. In terms of turning points, I think the thing I would say is, I mean, I had the great chance to go to a great university. I studied at Purdue University and then I went to work in the in the Fortune 10, and then almost 25 years ago, Steve, from as we chat here, I left to start my company which is now known as the Kevin Eikenberry Group. For many of those years I wasn’t leading anybody except myself. But you know, I’ve been blessed for last number of years to have a great team around me. They’re spread all across the United States and they’re currently 15 of us that are out doing this good work every day. So you know, that that decision to leave and start a company about 25 years ago, anyone would probably say that’s a turning point as well. Steve: So how do you ever do that, Kevin? How does that work? There’s a lot of people that think about it, right? They think they have an idea or they think they have a possibility and it’s a big risk. You know, you leave pretty much of a safe haven. So how do you do it? How do you make the jump and what are some of your thoughts about that? Kevin: Well, it’s like a lot of things, Steve. It starts with a decision. That’s being a little bit flippant, but it’s true. There’s a decision point and for me, that decision point was around trajectory. Where will I learn more in the next five years staying where I was, which was in a really great job. And I was well respected and had probably a very bright future there. And if I go out and start my own business. The clear answer was the trajectory of learning will be higher if I leave. I think the big lesson that I would say to people is that, I’ve coached some folks and I’ve talked to lots of people about this over the years is that, you know, there are probably some people listening Steve that are like you and me that are trainers, consultants, this kind of thing, I said, man, we’re hiring all these people in our company, look what we’re paying them, I should just go do it myself. I’m as good as they are. And while that might be true, that’s not enough to be successful. In order for you to be successful in a business, you have to have a lot more skills than just the technical ability of being a good auto mechanic, a good florist or a good consultant. First among those is you got to figure out how you’re going to market and sell? I think that that’s the thing that stops a lot of people once they start. And while I don’t think that’s why people are scared to start, it’s a big impediment to people. Steve: Yeah, that’s a good observation. And when someone makes a jump like that, some people actually are more well geared to work in an organization and can make an extraordinary contribution throughout their career. I mean, they can see it as a calling and it’s a perfect fit. Where other times, individuals just feel like there’s something else. So I think in our discussion today and for our listeners, what is good for one may not be good for another. You want to really listen to, you know, your feelings, your core strengths and where you can make the greatest contribution. But if you decide to go outside like Kevin did and others have, you certainly want to have your ducks lined up, but have the courage to follow your feelings. Kevin: Well, I think you’re right. We choose in our work here to support and help develop leaders because leaders have the greatest leverage to make a bigger difference in the world. And so there is absolutely no reason that everyone has to try to do what I’ve done. To your point, you have to find your place and where you can find great meaning. I would have had a great career and probably enjoyed my work a great deal had I stayed where I was. But that wasn’t what I was called to. And so we ought to figure that part out and not sort of say, “Well, maybe I really should,” Or, “I probably could.” Those things are really not important. What’s really important is where do you really feel like you belong and to your point where can I make the biggest difference, the biggest impact? Steve: Awesome. That’s great. I’m glad that you talked about that. Now, Kevin has so much experience really in leadership and working with small or large organizations, but also with change. One of the biggest things that’s happening in our world today is how do we best contribute to an organization and some of that’s done remotely. So one of the areas that Kevin has zeroed in on among his many skills and perspective which were so helpful is working remotely. So how about if we spend a little time on that? Maybe, if not most of our time because it’s not a subject that a lot of people talk about. I’m happy to do that. As you know, I’ve recently written a book about that, along with Wayne Turmel called The Long-Distance Leader: Rules For Remarkable Remote Leadership. I think you’re right. The world has changed. It’s not changing, it’s changed. If you look around, what does work place even mean anymore because so many of us are working in different places? We’re not coming to an office. Or if we are, we’re only coming there some of the time, right? Or our offices are at the client site and so I’m doing the work of an organization, but I’m doing it for a client so I’m not even with the rest of the people that are on my team. So this reality of a remote workplace is upon us. The genies out of the bottle. It’s not going back in the other direction. I think the biggest challenges is there, number one, relates to the change piece, which is people aren’t even realizing that that’s what’s happening. It’s like people are waking up and saying, man, where is everybody? Well, they’re all work, they’re just not here. So I think the biggest challenge of all is just recognizing that, okay, this is really where we’re at. Now, what do I need to do differently as a leader to support, encourage, engage my team who isn’t all down the hall? Steve: Okay, that’s a really terrific point. The world has changed and it will continue to do so and this is going to be something that will continue to be part of our lives. We’re far more mobile, you have devices, you have your office in your hand these days. So you’ve talked about your book a little bit and I hope you’ll talk more about it. What does your research tell us about remote leaders and why does it matter? Kevin: One of the things our research told us was that people feel that they’re doing okay. That as a remote leader, they’re doing okay, but they don’t feel like they’re doing well. They feel like they’re getting by. They’re kind of like the duck swimming in the water. Everything looks okay on the top but underneath the feet are paddling briskly. I think there’s a lot of leaders doing that and they’re covering up for some of the challenges by working harder and working more hours, which is not sustainable and isn’t really going to work. The other thing is that, I think our research and our survey that we use in relationship to the book, says a lot about the fact that there’s just not a high level of confidence in how well they are doing at leading a remote team. I think that leadership confidence is a is a big, undiscussed issue in our world in general, but when folks are doing it remotely and they’re not getting the serendipitous feedback, they’re not getting the just interaction with people, they don’t really know what’s going on, their confidence levels are even lower in general. I think those are big challenges that are facing our leaders. That’s some of the things that our survey has taught us, is that we need to help people figure out what the things to do are, help them do them better so that they feel better as well as actually having the confidence to do it successfully. Steve: So I’m going to invite you to tell us the name of the book again and then I have another question about this. Kevin: With pleasure. The book is called The Long Distance Leader Rules for Remarkable Remote Leadership. You can go anywhere to find a copy or you can go to longdistanceleaderbook.com. Steve: Okay, I’m glad you said that a couple of times. An old advertising agency adage is that a person doesn’t really get it until they’ve heard it six times. Kevin: Well, I’m at three, I’ll keep going and we’re not done with the conversation yet Steve. Steve: That seems to hold pretty true. Yeah, that’s right. We’re halfway there, aren’t we? That’s great. Okay, so what does a remote leader need to do to be successful, to have confidence, to be among the best? Because I’ll tell you frankly, I’ve had a couple of clients that they have had remote leaders or remote players and actually for a number of years and then it’s kind of gone south a little bit because they lost connection, say with the office or they just weren’t in tune with things. So how can you be a success? What do we need to do? Kevin: Well, I think the first thing is we need to realize that leadership is still leadership. And so the things that good leaders do are the same things you have to do, whether the people are down the hall or halfway around the globe. What’s changed is the how we do it. The best leaders know how to engender trust, they know how to build relationships, they know how to coach, they know how to set goals, they know how to communicate. They need to know how to do a bunch of things. But all of those things have nuanced differences, Steve, when we’re doing that at a distance, right? So the best remote leaders, the best leaders at distance are able to figure out, I’ll give you just several things. They’ve learned how to use the technology to their advantage. They’ve learned how to use the right technologies at the right times. They’ve learned how to set clearer expectations with their folks about the what is expected as well as the how we’re going to do the work. And they’re also much more intentional about how they interact with their folks. So think about it this way. If we were playing baseball and you go to bat three times and you get one hit, you’re hitting .333, right? That’s a great batting average. But if you only have three at bats, you better get a hit, right? If you are batting for a whole season, every single bat doesn’t matter quite as much. If you’re working in the office with people, you get lots of at bats. When your folks are remote from you, you have far fewer opportunities, right? You don’t see them in the hallway. You don’t have the quick interaction on the way to the coffee pot. They don’t stop poke their head in your office and say, “Hey, do you have a second?” Those things don’t happen. So we have fewer opportunities. So every opportunity that we have to interact with and communicate with our team members is of greater importance and so we have to be more intentional about how we do it well along the way. Steve: Yeah, that’s good advice. That’s really a great, great point. Now, some companies, actually in organizations struggle with working remotely and sometimes give up, so Yahoo or IBM, etc. What’s your perspective on that? Kevin: Well, those two, the Yahoo example and the IBM example are highly publicized a couple of years ago. Hey, we’re going to bring everybody back in, the remote thing isn’t working. That’s fine. I mean, I think there’s cultural pieces to that perhaps, but also in the IBM example, was an example of the kind of work that people was doing. You know, there’s some kinds of work that’s easier to do remotely than others, right? If you’re doing truly individual contributor work, if you’re processing loans, if you’re doing customer service, if you’re doing a lot of other kinds…I’m not saying these are these are lower tasks. I’m just saying that the nature of some work is that I’m much more focused on my individual production. We’ll get way more done if people are working remotely because they have fewer distractions. However, like in the IBM case, they were really wanting people to be very collaborative in the work that they were doing and some of that work might not be quite as conducive to being full time remote from everybody else. One of the things that we’ve learned, Steve, is that people can be very productive when they’re working by themselves, but they become very insular. They become very focused on their own work and it’s harder for them to collaborate. So if you’re struggling, your teams are struggling when working remotely, you need to think about what can I do to help them make sure that they see the big picture and that we help the collaboration really happen? That’s one of the things we want to keep in mind. So yes, some people have brought folks back in and there’s certainly nothing wrong with that. You know, I bring my whole team in twice a year because you need to spend some time together, right? There’s some work that’s just more conducive to see each other face to face than others. So I think it’s important that you think about the nature of the work and how you can best do it, and how you build the expectations for folks so that they can be successful based on what your expectations are. Steve: Yeah, I really liked that distinction, Kevin, that you’re outlining here. It depends on the job assignment. Sometimes you have a highly collaborative type assignment where it’s valuable to be together face to face and the success of your team or organization may depend on that collaboration, where other types, you know, they’re knocking things out and it’s highly focused and it’s not as required. That’s a good distinction. Kevin: And this does not mean that you can’t be collaborative when you work remotely. It just means that there’s got to be more support and clearer expectations around that and more work from the leader to help make sure that that’s happening. Steve: Kevin, have you found that modern technology, so video conferencing or maybe using more videoing, helps the remote to solve that problem? Kevin: There’s no doubt. You know, if you were to say, Kevin, if I’m a remote leader, what’s one thing I can do tomorrow to be more successful? The thing I would say is turn off your email and turn on your webcam. You know, I don’t think there’s any question that the next best thing to being there. I think there’s an old commercial somewhere. But the next best thing to being there is your webcam. And so get people used to that. Set the expectation that that’s what we’re going to do. You don’t need to be a dictator about it, but really don’t give people much of an option about that. Say, we’re going to use our webcams because it allows us to have more effective communication. And so let’s have more synchronous communication, whether that’s over the phone or whether it’s on a webcam as opposed to just email, just sharing a file, etc. You know, we’re talking about this book the The Long-Distance Leader, I co-wrote it with Wayne Turmel who is on our team. And we did not write any of it when we’re at all together. It was all done remotely and the interaction that we had about it was all done, where we were sharing the screen and sharing webcams. So there’s no doubt that we can have highly successful collaborative outcomes, but we’re going to have to be comfortable using the technologies and using again, the right technology, Steve, so that we can be most successful in a given situation. Steve: Well, Kevin, we’ve talked about some great things today, but for me, that’s going to be my best take home. That’s going to change me. I’m going to do that a lot better. I’m just thinking what a jump that can be. That’s good. That’s good stuff. Kevin: Well, I’ll just give you an example. So you know, you and I are doing this, having this conversation over Skype and it’s only going to be released via audio which is perfectly fine. But, you know, if we were looking at each other while we were doing it, this would be more effective. Because I would not interrupt you or vice versa. We would have a little better sense of where we were headed. All of those little things, the visual cues that are lost. Just as an example. We have tools that are so easy now and the quality is so good and they’re free in order for us to be using our webcams, right? Unless you have major firewall issues in your organization. And I just say that’s the first thing I’d be doing. Is figuring out how you can have more of your conversations where it’s closer to being there. Steve: Okay, good stuff. And that’s not limited to business, is it? Kevin: It absolutely is not. In fact, was hearing this last, but we still hear this, well, I don’t really like being on video and people, you know, I don’t really want to be on video. Then I’ll say, well, do you do you FaceTime with your grandkids? Well, yeah. So that kind of went right out the window, right? And then they’ll say, well, Kevin, I don’t want to look at myself. I said, don’t look at yourself, look at the other person. That’s the point, right? You don’t have to look at yourself on the video, look at the other person. Steve: Good stuff. So what special challenges does leading remotely create for the organization? From your perspective what do you see? From your experience? Kevin: Yeah, well we’ve talked about I think about several. But I think one of those is how do we build trust across the team and not just between me and the team members as the leader, but across the team. So one of the challenges is making sure that the team gets to know each other. Not just that you’re building a relationship with them as the boss, but making sure they’re building relationships across the team. That’s a challenge that we really need to think about. There are ways to solve it, but we really need to think about it and I think that’s another one that often doesn’t get discussed or addressed. Steve: Well, that’s great. This has been a wonderful discussion about this. And at least on our podcast, I don’t think we’ve had a guest that’s talked about this aspect of remote leadership. So thank you for your thoughts. Kevin: That’s been a pleasure, for sure. Steve: Okay. If you don’t mind, I’d like to just go a little bit of a different direction. Kevin has written a book called Unleashing Your Remarkable Potential. What’s the exact name of that? Kevin: Well, that’s the name of our weekly newsletter, Unleashing Your Remarkable Potential. But the Remarkable Leadership book has that as a subtitle, which is unleashing your leadership potential one skill at a time. Steve: Yeah, it’s remarkable leadership. 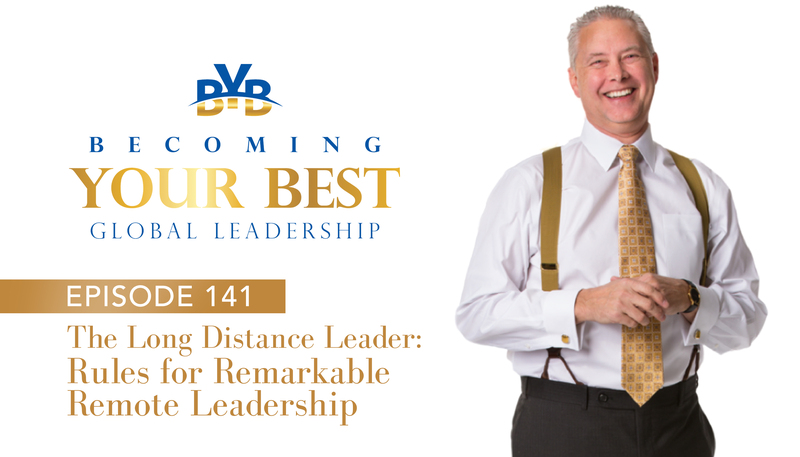 Through Kevin’s research, he’s identified 13 things that helps you be a Remarkable Leader and since in Becoming Your Best, we’ve identified 12 principles. There’s a little story behind this, Kevin, and that is when we went to McGraw Hill who’s our publisher for Becoming Your Best, it was 13 Principles of Highly Successful Leaders. Kevin: In our previous conversation, we’ve obviously had a lot of overlap between your work and ours, which is one of the reasons I think that we connected so well. Steve: Exactly. But ultimately McGraw Hill said, no way you can’t have 13, that’s unlucky. So he said make it 12. Well, the one that we cut out was do the best thing. And I guess because that’s the overall spirit of, you know, what we were writing about? Do you mind telling our listeners what are some of your 13 things that remarkable leaders do? Kevin: Well a lot of competencies surprise people. You know, the competencies include communication and developing others and some of those. But the one that I think piques people’s interest the most and I know that you agree with me on this and it’s the first one of our 13 competencies which is that remarkable leaders are continual learners. I share that because everyone that’s listening you’re not listening to this podcast if you’re not some level continuous learner and a continual learner. So I believe that you cannot become anything close to the leader you’re capable of being if you’re not continually learning because there’s there are so many nuances and there are so much complexity of leading other people that I believe that that’s critical. And I’ve never met a leader, Steve, that didn’t want their team members to be learning. And of course, the best way to influence any behavior and others is to be an example of it yourself. Steve: Yeah, great. Well that’s wonderful. Well, good enough. Any final tips for our listeners today. What are your golden nuggets that you can leave aside from the wonderful ones you already have? Kevin: I’m just going to say it again, turn off your email, turn on your webcam. Realize that if you’re leading a remote team, then it is the little things that you need to be intentional to do that you can’t do automatically when they’re at a distance that you have to do more of. And so again, it’s been a pleasure to be with you and again, the book is called The Long Distance Leader: Rules For Remarkable Remote Leadership. And you can go buy the book anywhere. You can go to longdistanceleaderbook.com or you can get a sample chapter. You can even get some bonuses if you let us know that you bought a copy book. Steve: Okay I’ve been keeping count Kevin, that’s number five. One more time. One more time, we can make it to six in this podcast. Kevin: The Long Distance Leader: Rules For Remarkable Remote Leadership. There you go, there’s six. Kevin: So again we’ve given you the book website, but you can go to kevineikenberry.com. You can also go to remoteleadershipinstitute.com. That’s where our work around remote leadership takes place at remoteleadershipinstitute.com. Steve: Yeah, perfect. Well, thank you Kevin, for being a part of this show today. It’s been wonderful. Kevin: Thank you for having me. I appreciate it. Steve: All right. Well, we wish you all the best, our wonderful listeners as you continue to make a huge difference in the world. It’s these type of things that we’re talking about today. The reason that you’re listening is you get an idea here and there, but it’s these little ideas that as you apply them one day you wake up and you’re already making a difference, but this difference is expanded. So we wish you all the best. Remember every single day your light has the chance to shine brighter and affect a person in a significant positive way. I’m Steve Shallenberger with Becoming Your Best Global Leadership wishing you a great day.